If you read my initial article on "Passing - An oddity in how it's measured in Soccer Part I"; I hope you find this article of value as well as the onion gets peeled back a bit further to focus on Crosses. To begin please consider the different definitions of passing identified in Part I and then take some time to review these two additional articles (Football Basics - Crossing) & (Football Basics - The Passing Checklist) published by Leo Chan - Football Performance Analysis, adding context to two books written by Charles Hughes in 1987 (Soccer Tactics and Skills) and 1990 (The Winning Formula). My thanks to Sean McAuley, Assistant Head Coach for the Portland Timbers, for providing these insightful references. "It's criminal that crosses aren't considered passing statistically speaking. Any coach or player knows the art and skill of passing and realizes the importance of crossing as it's often the final pass leading to a goal. If anything, successful passes should count and unsuccessful shouldn't as it's more like a shot in many ways that has, I'm guessing, little chance of being successful statistically speaking yet necessary and incredibly important." Once you've taken the time to read through those articles, and mulled over the additional thoughts from John Galas and Jamie Clark, consider this table. Stat Golazo/MLS STATS Squawka Whoscored MLS Chalkboard My approach Different (Yes/No)? * NOTE: MLS Chalkboard includes unsuccessful crosses as part of their unsuccessful passes total but does not include successful crosses as part of their total successful passes; it must be done manually. For many, these differences might not mean very much but if looking for correlations and considering R-squared values that go to four significant digits these variations in datum might present an issue. I don't track individual players but Harrison and Matthias do, as does Colin Trainor, who offered up a great comment in the Part I series that may help others figure out where good individual data sources might come from. I (OPTA representative) have has (had) a word with our editorial team who handle the different variables that we collect. There is no overlay from crosses to passes as you mentions, they are completely different data variables. This is a decision made as it fits in with the football industry more. Crosses are discussed and analysed as separate to passes in this sense. We have 16 different types of passes on our F24 feed in addition to the cross variable. So OPTA doesn't consider a cross a pass - they consider it a 'variable'?!? Well I agree that it is a variable as well and can (and should) be tracked separately for other reasons; but for me it's subservient to a pass first and therefore should be counted in the overall passing category that directly influences a teams' percentage of possession. Put another way; it's a cross - but first and foremost it's a pass. (Perhaps?) OPTA (PERFORM GROUP now) and others in the soccer statistics industry may reconsider how they track passes? My intent is not to call out any statistical organizations but to offer up for others, who have a passion for soccer analyses, that there are differences in how some statistics can be presented, interpreted and offered up for consideration. 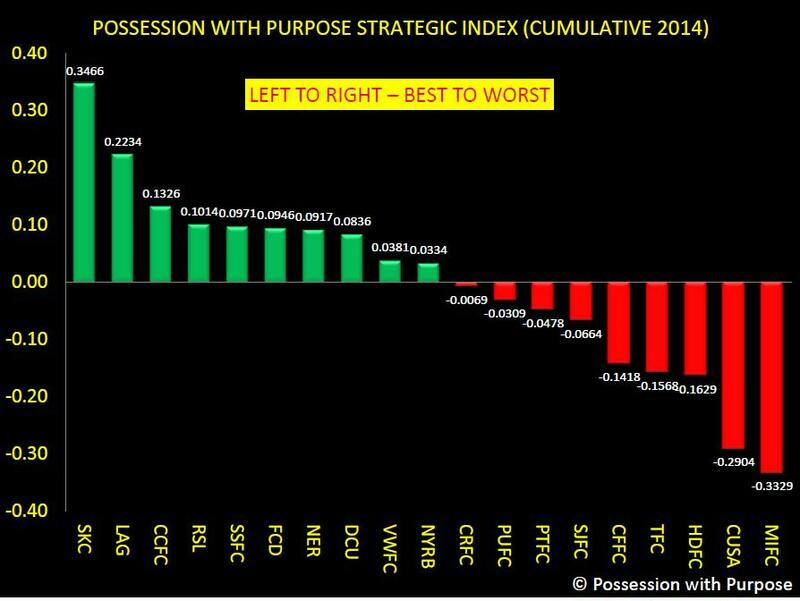 In my own Possession with Purpose analysis every ball movement from one player to another is considered in calculating team passing data. Perhaps this comparison is misplaced, but would we expect the NFL to call a 'screen pass' a non-pass and a variation of a pass that isn't counted in the overall totals for a Team and Quarterback's completion rating? 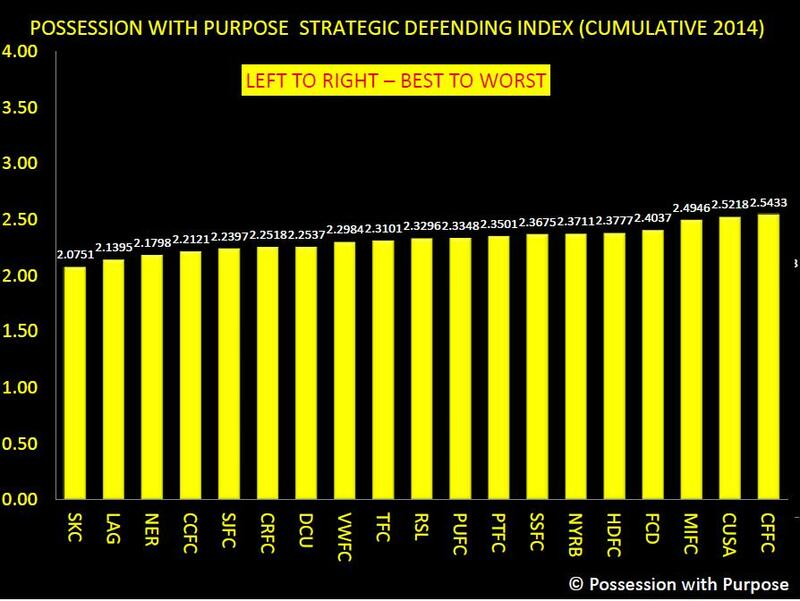 Here's a great exampleon how Possession Percentage is being interpreted that might indicate a trend. 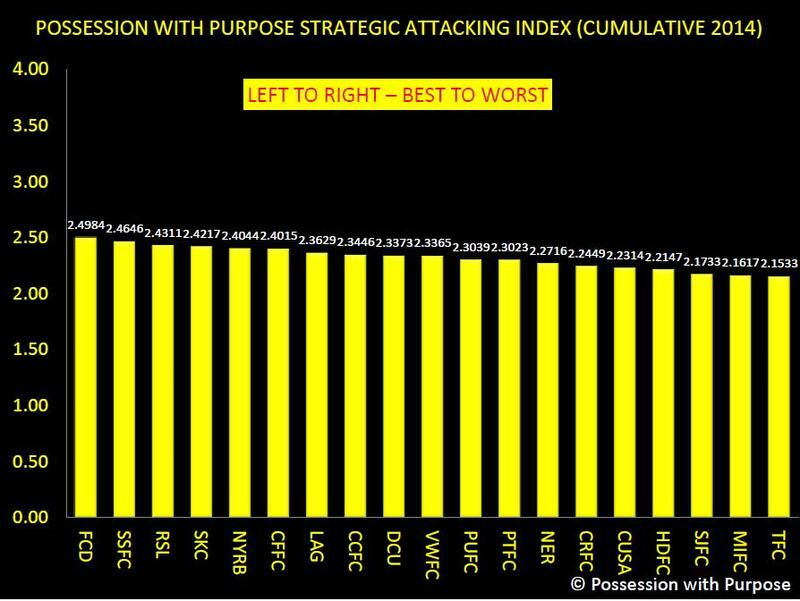 Ben has done some great research and sourced MLS Stats (as appropriate) in providing his data - he's also offered up that calculating possession is an issue in the analytical field of soccer as well. In peeling back the data provided by MLS Stats he is absolutely correct that the trend is what it is... 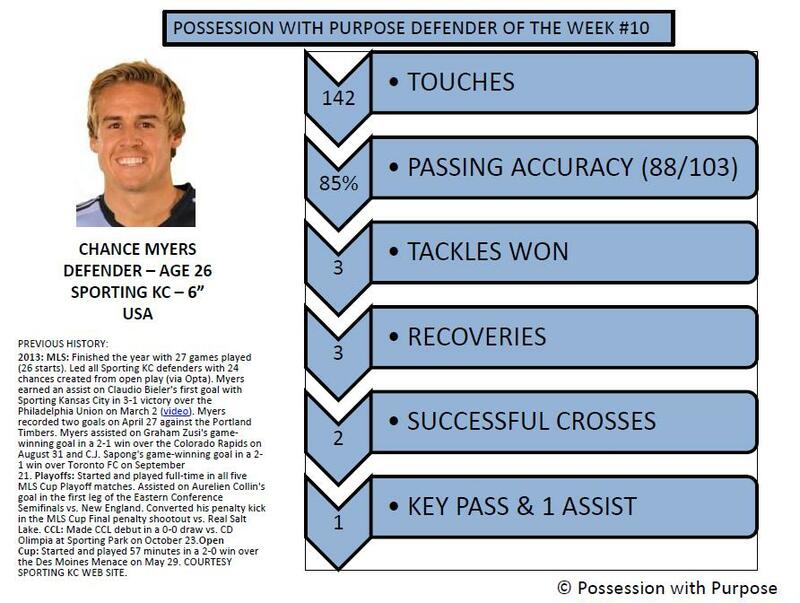 When adding crosses and other passing activities excluded by MLS Stats the picture is quite different and lends credence to what Bradley offers. For example--when adding crosses and other passing activities not included by MLS Stats--the possession percentages for teams change, and the R-squared between points in the league table comes out as 0.353, with only 7 of 8 possession-based teams making the playoffs. New York, with most points, New England and Colorado all had possession percentages last year that fell below 50%, and only one team in MLS last year that didn't make the playoffs finished with the worst record (16 points) DC United. For me, that was superb research - a great conclusion that was statistically supported. Yet, when viewed with a different lens on what events are counted as passes, the results are completely different. So last week, ironically at about this exact time, I wrote about WhoScored entering the realm of American soccer and how awesome and exciting it was that they were going to start providing and publishing statistics for MLS---allowing us to skip the process of having to count up all the individual games, not to mention the time-consuming tables that Matty puts together. Now we have much of that information at our convenient disposal. Well we are getting even more spoiled as now Squawka joins the fray of MLS statistics. If you haven't been to Squawka yet, you need to visit their site. It's not just a great collection of information, it's visually stimulating and helps put things into a context, helping to convey a message better than some writers, especially me, can convey. This isn't just an awesome thing because it makes mine as well as my associates' lives easier. It's awesome because it's adding to what WhoScored does, not competing with them. This isn't FanGraphs vs. Baseball-Reference where you have similar but altogether different ways of arriving at thoughts and ideas that really confuse the hell out of you---like when you are trying to come up with whether or not Ricky Nolasco had a good season. Sure there are some subtle differences between the two sites, and even how they end up rating a player. But this isn't about exact sciences at this point. It's more about making data prevalent. A big shout out goes to Nic English and his crew for getting this out there. Job well done. We've talked quite a bit about game states on the blog over the last few weeks, both linking certain articles as well as talking about it on the podcast. The ability to take specific events and associate context with them to provide a better understanding of the match results is helpful. However, there are times when I think Game States need to be refined based upon the situation. Take for instance our "game of the week" selection, New York Red Bulls at home against the potent Los Angeles Galaxy. There is a lot I could say about leaving Mike Magee behind in LA and losing Juninho just 10 minutes into the match. Attempting to use the typical goal game state doesn't really work simply because of the lone goal was scored at the 91 minute mark. 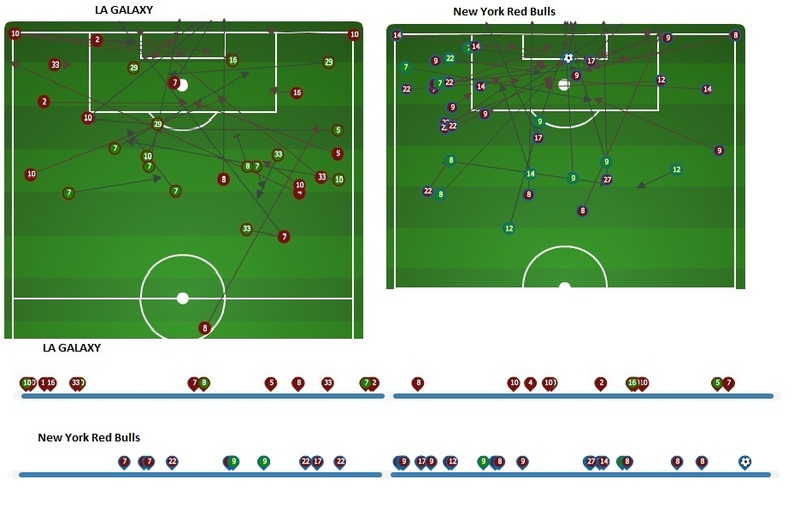 If we were looking at this in a season long context and we wanted to see how good a team was in the "even goal state," or maybe how long they played in an even goal state, 90+ minutes of data this match would go towards that game state and presumably help speak to each team's ability. The problem is that on an individual game basis sometimes there is a need for another way to really apply context to this game. Naturally, with the injury to Juninho the first thought is to apply game states to substitutions rather than goals. The problem with that---omitting Juninho's substitution---is that substitutions take place in bunches in the second at the end of the game. It's becomes difficult to separate where exactly there was a specific difference maker. So I kind of abandoned the thought of single game states in this scenario and instead looked more for another pattern. Above is a bit from the MLS site chalkboard. Events on the timeline have been taken from each team, and each has a corresponding event associated with it on the map of the pitch. I specifically used offensive-associated filters to help give me an idea of the effectiveness of each team and how often it was involved. The specific filters used were: Through balls, Crosses (both successful and unsuccessful), Key Passes, Shots on target, shots off target and lastly, blocked shots. These are all decisively aggressive methods that appreciate a teams ability to drive towards the opposing goal. I'm not exactly sure what to make of all it, there are almost distinctive time blocks that belong to each team as they would hold the ball and look for their own attempts on goal. You can see that each team had a couple of chances in the last 10 minutes and it came down to a bit of luck in the circumstances of the lone goal. The timeline itself looks almost like heart beat rhythm between each team and their respective attempts towards the opposing goal. This is kind of the pattern I was looking to find, but I don't exactly know what to do with it. In summation of the actual game, you could make some Carlos Cudicini references---see: Matthew Doyle for snark---and put a nice little bow on it. Yes, I do agree that LA's Italian keeper should have come out of his goal to clear the attempt, but I happen to also think that this single game came down to a rather random occurrence. A simple mistake from a goal keeper who has been in residence at some prestigious clubs. The league average team finishes a shot roughly once every 10 attempts. 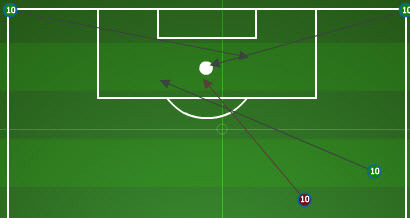 The New York Red Bulls scored on what was their 10th attempt at goal. While LA was stuck at 9. I know it's not popular but I believe that sometimes it's not necessarily about strategy or anything deep tactically. Instead, maybe it's about fighting for 90 minutes, putting up as many (good) shots as possible and hoping one of them goes in. That sounds a bit Charles Reepish... I know, but sometimes it's true. Sometimes the ball just finds its way into the back of the net. Humans make mistakes and even the best goal keepers do, too.